Pe 8 Mai, in Qunatic, Watain promit un show memorabil in cadrul turneului european 'Eastern Eclipse'. Am avut ocazia sa schimbam cateva vorbe cu ei. Ce a iesit vedeti mai jos. 1. Back to Romania! What can you tell me about the tour? 2. Trident Wolf Eclipse was released a year ago. It was quite a back to the roots album, what drove you to this direction? 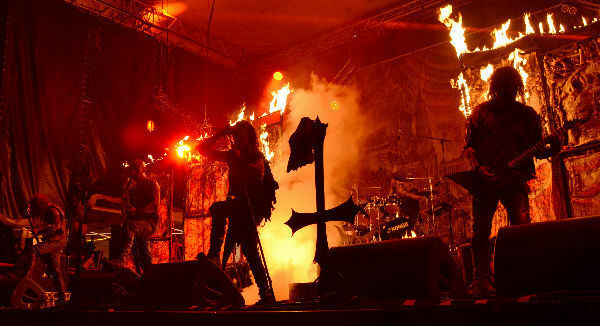 The same thing that has always driven us; our passion, our conviction, our faith in Watain. The knowledge of that we must do what has to be done. I don’t know what roots you are talking about going back to, I dont really think the album sounds much like Casus Luciferi or even Rabid Death’s Curse. But these kind of things I leave for other people to debate while we stay busy with what is going on in the grim light of the present day. 3. What's you opinion on nowadays black metal bands? Do you still think that black metal is a niche genre? Is it still the most underground metal style? The answer to the first question is the same as always; some are good, many are s**t. Nothing new there. Venom was one of the biggest metal bands in the early 1980s, certainly not very underground. There will always be an underground and a mainstream, regardless of genres. People are far too obsessed with these ideas. They have to start focusing on the actual art and music, not on wether or not it’s underground or mainstream. Do you think the Gods that exhale their sacred breaths through our music gives a f**k about such things? 4. Talking about black metal roots, have you seen the 'Lords of Chaos' movie or are you aware of all the fuss around the movie? What's your opinion on it? I am a good friend of Jonas Akerlund so i’ve been seeing this movie coming together from the start. I’ve always been 50% sceptical and 50% intriguied by what he was going to do, since the subject is of course very dear and close to me. In the end I think it ended up a bit too far from my own perception of the atmosphere and emotional spectrum that I relate to these events. It is clear that Jonas had a different approach to the whole thing that someone who was deeply involved in, and cared deeply for, Black Metal, which should be quite obvious. But I know that he worked very hard to get many things right and I know he was very emotionally involved in the whole project, so it’s still interesting for me to watch. He was also in close contact with the families of both Dead and Euronymous and that is to me a very important thing to take into consideration. In any case, I definitely do not think that it will do any damage to Black Metal that has not already been done. I also think it’s very embarrasing with people who are so against this movie for whatever reason but were not even born when these things happened. 5. You are one of the few bands that kept the black metal philosophy intact, why do you think that many other bands shifted or they somehow lost the true meaning of this music? If you dont believe in what you are doing from the bottom of your heart then you will eventually loose interest and move on to new things. If you have always lied to yourself about your art then sooner or later those lies will catch up with you. Another thing is that people “grow up” and feel the need to leave the darkness and the mystery behind them in favour of a more normal life among men. Neither of these alternatives have happened to Watain, which is why we also go on with an ever increasing pace. 6. Where do you draw your inspiration when it comes to lyrics and music? 7. Going back to the time when Watain started, what were the bands that influenced you? Our biggest inspirations were for sure Mayhem, Dissection and Bathory. That's also what you can hear most of in the sound of the early material I think, if you look for that sort of stuff. Conceptually we were also very inspired by bands like Blasphemy, Beherit, VON and also some of the swedish underground bands that were very active around the time we started such as Nifelheim, Ofermod, Funeral Mist, Malign etc. We were deeply involved in the underground scene and were always looking for the most raw, Satanic, dangerous type of music and art. I was also alot into industrial / power electronics around then and bands like Sutcliffe Jugend, Con-dom, Grey Wolves etc. 8. For someone who is not accustomed to black metal, what artists or albums would you recommend to start with in order to better understand this genre? 9. Now, talking about your show in Romania, will the playlist revolve around Trident Wold Eclipse or will it be a musical journey throughout your discography? Something more akin to the latter I think, we usually make set lists with songs from each album. But it also depends on the night in question, the venue, the atmosphere of the place etc. Lately we have been doing about a third of the set with songs from T W E and the rest from older albums. 10. The last words are yours! We are very much looking forward to open the gates to the Temple of Watain in Romania again, and invite you all to a violent and bloodsoaked ceremony in the name of the Black Metal Cult and its Gods. The last time we visited Romania the venue burned down afterwards, so we’ll see what happens this time! Asadar, 8 Mai, Quantic, Bucuresti! Fiti prezenti pentru un show autentic de Black Metal.